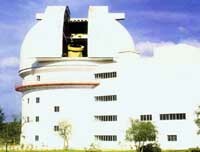 Kavalur Observatory is located in Kavalur in the Javadu Hills (a part of Eastern Ghats) in Alangayam, Vellore District. The observatory is at an altitude of 725 m above mean sea level (longitude 78° 49.6' E ; latitude 12° 34.6' N). Apart from being reasonably away from city lights and industrial areas, the location has been chosen in order to be closer to the earth's equator for covering both northern and southern hemispheres with equal ease. In addition, its longitudinal position is such that it is the only major astronomical facility between Australia and South Africa for observing the southern objects.